Full mouth reconstruction is a solution that transforms missing, decayed, and/or cosmetically damaged teeth into a new, fully functioning, beautiful smile. It is a great option for patients with a variety of needs, including those who have experienced bone loss over the years, those who are experiencing an uncomfortable bite, those who have missing teeth due to decay, and more. After a consultation at our office, our doctors will create a custom treatment plan that caters to the specific needs of the patient. The treatment plan will be reviewed with the patient and leave them with a completely new, rebuilt set of teeth at the completion of treatment. 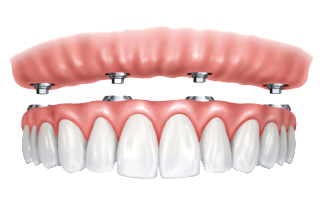 Overdentures snap in and lock into the implants. They can easily be taken off and put back on by patient. Hybrid dentures can only be removed by your general dentist for regular cleanings. They are otherwise fixed in place. Whether you have questions about full mouth reconstruction or any other procedure, we're here to help. Give us a call at 402.327.9400 or chat us through our live chat where our specialists are happy to help you with any of your oral surgery needs. You may be a good candidate for full mouth reconstruction if several to all of your teeth have been compromised due to decay, bone loss, trauma, or other health issues. 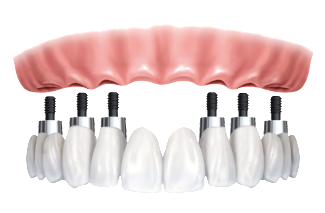 Visit our page on Dental Implants to learn more about how an implant overdenture or hybrid implant denture can benefit you.